Presented By: ECHO Asia & Lisu Baptist Assn. 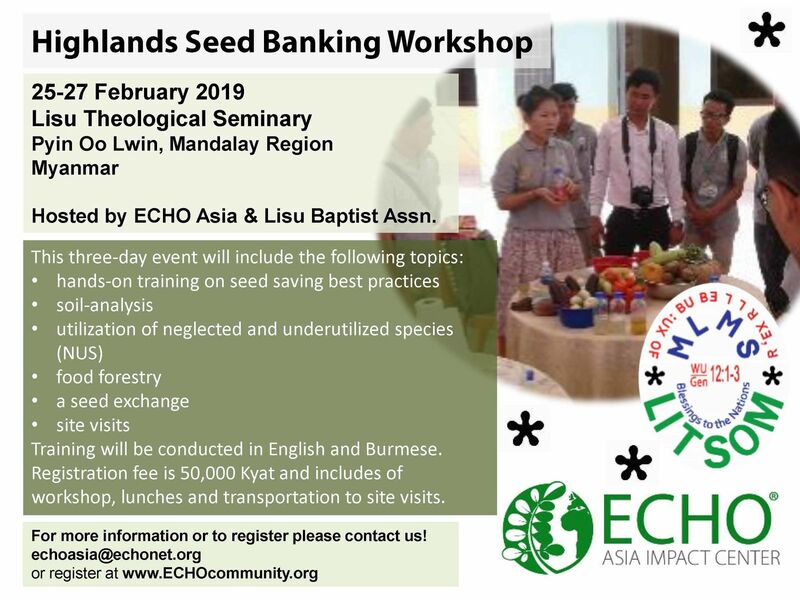 ECHO Asia, in conjunction with the Lisu Baptist Assn., welcomes anyone working in agriculture and community development to attend a seed saving workshop from 25-27 February 2019 in Pyin Oo Lwin, Mandalay Region and the Lisu Theological Seminary. Training will be conducted in English and Burmese. The cost for this 3-day training is only K 50,000 kyat or $35 USD including lunch and transportation to site visit. Option 1: PayPal. You can pay directly at any time. https://www.paypal.me/ECHOAsia If they would like a formal invoice from PayPal we can do that too. If you don't mind Please add more 5% for PayPal fee. Option 2: Bank Transfer. People in Asia (especially in Thailand) can send payments directly to our Bank. Once you register we can send the bank transfer information to you. Option 3: You can pay cash to our local contact, Mr. Thuang Si. Please contact us at echoasia@echonet.org if you need recommendations on lodging. Lunches and transporation to site visit included.